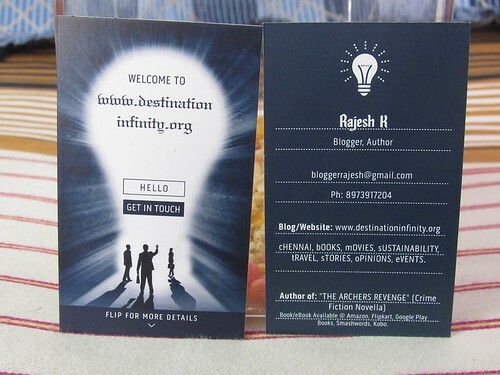 My Blogger Visiting Card!! Howzzz ittt?? The card is fine. I like it. During my career, I always had a business card with my name, my title, and my company’s name. Personally, I was not fond of that. I always wanted to have a business card with just my name only. I want people to know me by my name only and not by my title or the company I am associated with. background color of card you should consider it before printing in bulk. THat is very good .. Very creative and nice! Liked it! Cool idea Rajesh! I don’t remember seeing a vertical card used or shared before… like i said in FB the color feel little dull, but I don’t how it look in natural light. Because there’s could be difference between photo and real. Yes, it looks better in natural light, but I would have still preferred brighter options/shades. I loved it DI! Already liked it on Facebook.